Brokers and Agents Are Welcome! Property is vacant land. Interested parties can view the property on their own timeline. Call Broker Mark Shear with questions at 508-769-9419. This investment opportunity will be offered in the entirety and consists of 16.6 +/- total acres divided into a 5-Lot, Town Approved Residential Sub-Division ranging from 2.85 – 3.8 acres/each. The land is classified as “Potentially Developable” (code #1310). 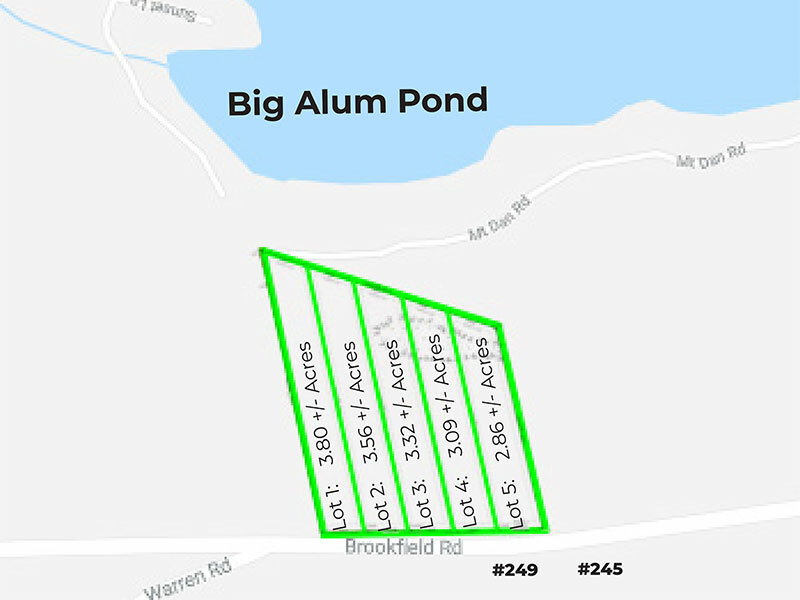 Parcels are situated high above “Big Alum Pond” and may provide great scenic views off the back. Sewer and electric utilities are present on Brookfield Rd. Location is about 1 mile from Tantasqua Regional High School and provides easy, quick access to shopping, dining, I-90 (Mass Pike), I-84 & Rte. 20. See Sturbridge Assessor’s Map 173, lot -00943-250, Worcester Registry of Deeds, Book 58476, Page 225. Buyer Broker/Agent participation is welcome. Route 20 West to MA-148/Brookfield Rd. (Opposite # 245 & 249 Brookfield Rd). Property is south of Warren Rd., on NE side of Brookfield Rd. * A 10% Buyers Premium will be added to the winning bid to determine Total Purchase Price. A deposit of Ten Thousand Dollars ($10,000.00) by cash or certified/bank check will be required to be paid by the purchaser at the time and place of auction. The balance is to be paid by certified or bank check at office of Attorney for Sellers within (45) days from the date of sale. The successful bidder shall be required to sign a Memorandum of Sale containing the above terms and additional terms (if any) announced at the time and place of sale. ** Buyer’s Broker MUST pre-register on Berman Property Solutions’ website at least 48 hours prior to Auction. Q: Why are there no pictures of the inside of the house? A: If this is a foreclosure sale, we typically do not have access to the inside of the property, and therefore cannot take pictures of the interior. Because we have not been inside, we cannot confirm how many bedrooms or bathrooms are in the property. So, we must rely on the town’s public records regarding how many rooms they list. A suggestion: You could try searching the internet for the property address to find pictures of the inside of the property from other sources. Q: Why isn’t the ad for the property more descriptive? A: If it is a foreclosure sale, we typically do not have access to the inside of the property, we cannot confirm what the interior of a foreclosure property looks like, how many rooms it actually has, or any other specifics that would enable us to make an ad more exciting and descriptive. The only information we have is the public record and what the property looks like from the outside. Q: Why is there no price listed? A: Properties without a price are being sold by auction. In some cases, these are foreclosures; in others, they are auctions-by-choice (the seller decides to sell their property via the auction method). The property will go up for auction on the date noted, and the price will ultimately be determined by those bidding on the day of the sale. The property will be sold to the highest bidder. If it’s a property you really like, come to the auction and bid – if you are the highest bidder, it can be yours! In other instances, we will have properties listed on our website with a price clearly marked – these are being sold via the traditional real estate listing method or through our unique hybrid method (traditional listing plus auction).